Notification for TNSPC Executive Officer (EO) Grade I in Hindu Religiuos and Charitable Endowments Department included in Group VII A Services. 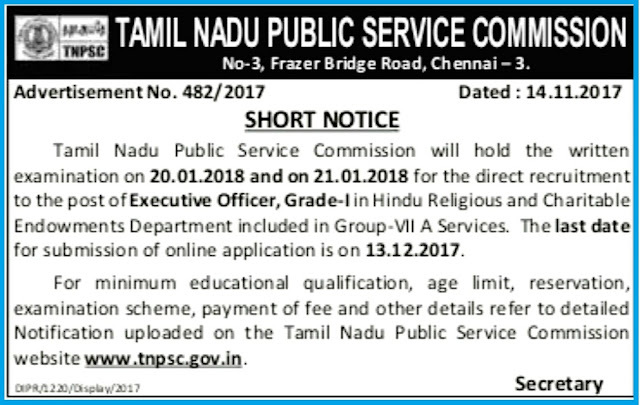 Tamil Nadu public Service Commission (TNPSC) will hold the Written Examination on 20.01.2018 and on 20.01.2018 for the Direct recruitment to the Post of Executive Officer (EO) Grade I in Hindu Religiuos and Charitable Endowments Department included in Group VII A Services. The Last date for Submission of Online Application is on 13.12.2017. For Complete Notofication, Minimum General Educational Qualification, Age Limit, Reservation, Examination Scheme, Payment of Fee, Syllabus, and other details fefer to detailed Notification uploaded on the Tamil Nadu Public Service Commission website www.tnpsc.gov.in. (as on 14.11.2017) Applicants should possess the following or its equivalent qualification. Provided that other things being equal, preference shall be given to the employees of Religious Institutions (other than Government Servants) who have put in not less than 5 years of Service. Provided that other things being equal, preference shall be given to persons who hold a Diploma in Epigraphy and Archaeology awarded by the Institute of Epigraphy in Tamil Nadu. Selection will be made in two successive stages i.e., (i) Written Examination and (ii) Oral Test in the shape of an interview. Final selection will be made on the basis of the total marks obtained by the applicants at the Written Examination and Oral Test taken together subject to the rule of reservation of appointments. Applicants appearance in the Written Examination and Oral Test is compulsory. An applicant who has not appeared for the Written Examination or the Oral Test will not be considered for selection, even if he/she secures qualifying marks for selection. TNPSC Study Materials for TNSPC Executive Officer (EO) Grade I in Hindu Religiuos and Charitable Endowments Department included in Group VII A Services. This Study Materials covers Tamil Notes, Quiz, Model Questions and Answers in PDF Format Download.